A visit to North Berwick would not be complete without climbing to the top of Berwick Law with its panoramic views of East Lothian and beyond. To the west you can see Edinburgh Castle and the Forth Bridge; to the north the Firth of Forth and Fife coastline; to the east the ancient curtain walls of Tantallon Castle and the Lammermuir Hills to the south. From the car park at the foot of Berwick Law follow the track round the base for a short distance before starting the ascent. The path on the south west leads to a plateau over the former quarry and then wynds its way to the summit, 615 feet above sea level. Berwick Law is composed of igneous rock formed during the early carboniferous era. This area was the site of many volcanic eruptions and the Law is the result of the mouth of the volcano being choked with its own molten lava, forming a plug when extinct. During the ice-age, Scotland was covered in a frozen glacial blanket that rubbed and wore away the volcanic ash and soft sedimentary layers. When the glacier receded it exposed the black rock visible today. On the south of Berwick Law there is evidence of at least eighteen hut circles, rich middens and a field system dating from 2000 years ago. There is also the remains of a defensive stone dyke and ramparts which were not just military artifacts but show that farming and a peaceful settlement was a feature here. Berwick Law was originally owned by the Cistercian Convent and used as a look out to warn of approaching enemies. It was told that a nun lit a beacon on the summit in 1544 when English ships entered the Firth of Forth. The stone building at the summit was erected in 1803 as a signal station during the Napoleonic Wars. Lieutenant Leyden was in command with a party of Naval Ratings who were instructed to light a beacon on the sight of enemy forces which would then start a chain of fires on high points across the country, providing an early warning system. Adjacent to the ruined building is the outline of a garden and beyond a concrete observation post used during WW1 and WW2. In 1803, when the French invasion was expected and an alarm was to be given that the enemy had landed, the North Berwick regiment of volunteers commanded by Captain Robert Burns including those of Aberlady and Dirleton parishes were ordered to assemble at North Berwick. They were to join and act with other troops and proceed to occupy the strong position of Whitekirk Hill and to oppose the landing of the French at Peffer Sands. The general orders were given at West Barns camp, 19th November 1803, by Major General George Don, who was one of Sir Ralph Abercrombie's officers at the battle of Alexandria in 1801. The landmarks mentioned above can be identified on the bronze and stone direction plaque (right) erected at the summit in 1959 as a memorial to John Wallace Menzies, Town Clerk from 1926 until his death in 1956. 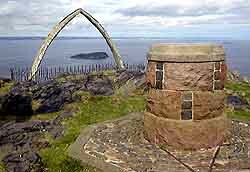 There has been a whale's jaw bone erected at the top of Berwick Law since 1709 as a land mark to guide the sailors home safely. According to Francis Grose in his Antiquities of Scotland published in 1797 the original jaw bones were replaced around 1789. They were renewed in the 1850s by landowner Sir Hew Hamilton-Dalrymple from an old Dunbar whale ship. In 1933 they were blown down and replaced two years later by a jaw bone taken from an Antartic whale, gifted by John Dunlop, the son of a North Berwick Town Councillor. In 1935 the jaw bone was brought to the town by railway wagon when it still had whale meat hanging from it. James Mitchell the farmer at Bonnington attached the bone by chain to his Clydesdale horses and dragged it up the hill. 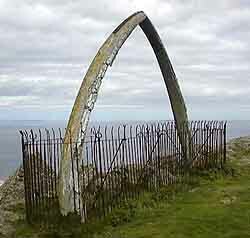 After years of buffeting by the wind, the jawbone became unsafe and was taken down on Monday 20th June 2005. The last bonfire to be lit at the top of Berwick Law was in 1953 to celebrate the coronation of Queen Elizabeth II. 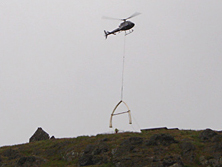 A new whale bone made from fiberglass was lifted into position by helicopter on 26th June 2008. The replica jawbone is 6.5m (21ft) in length, five metres of it is above the ground and the other 1.5m will go into the ground. It weighs 560kg (88st) and the total cost of replacing the jaw bone is about �20,000, funded by Friends of North Berwick who were a group of local businessman who wanted to provide private funding for this one off project, with East Lothian Council paying around �5000 to transport the giant jawbone by helicopter to the summit. It was fabricated by father and son team Tom and Colin Blackie of Ralph Plastics, Macmerry. They used the previous whale bones to cast exact replicas from fibreglass reinforced with wood and steel for a weatherproof finish. Remember to make your descent in the same westerly direction as you climbed up. The cliffs on the north can be dangerous. Looking to the west you will notice a resevior surrounded by a plantation of trees at the base of Berwick Law, this was the sourse of the town water supply in the 1870s. The overflow which passes the car park becomes the Glen Burn and enters the sea in Milsey Bay at the east links. On the south is the remains of an old quarry which supplied the reddish-brown stone used extensively during the nineteenth century and gives the town a distinctive colour and style. The masonry on the buildings in Quality Street are unique due to a vent of black carboniferous basaltic rock found at the quarry and used to pin the reddish brown blocks in the stonework. Another example of this can be seen on the building at 23-25 High Street. The quarry was closed in the 1950s, and re-opened in the 1960s especially to supplied the materials used to construct Wishart Avenue. by law. Metal detectors and damage is prohibited. Town Centre to the top of Berwick Law - one hour walking.